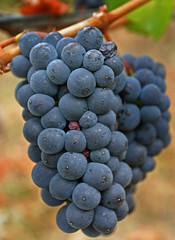 Wine Blog » Blog Archive » If You Were a Wine, Which One Would You be? I have to even think about that one, but I’d say a Pinot Noir/Burgundy. My mother’s maiden name was Bernier, rhymes with Viognier, so it has to be a French representation. I lived on the east coast for most of my life, so I know I’ll never be a true Californian. I like the heat and drying out, as well as all this sunshine, but I’m not from here. I’m a transplant. I guess I’m more Euro centric than seismic. I like a Burgundy’s color… It’s not a white wine, and although there are some pretty complex white wines, I know I’ve been through much more maceration in my life than a white wine ever encounters. And yet, a really great Pinot is not so over the top red with color. I don’t believe that I have that many tannins, so I’ve got to go a bit lighter with a Pinot. I love how a great Pinot is soft and round… Maybe it’s the age I’ve developed that has me wanting to be kinder and gentler with all that I do. I prefer to be in balance, and not swinging with too much acidity, pH, or alcohol. So, back to my original question, “If you were a wine, which one would you be?” You don’t have to leave an explanation, if you don’t want to. You’re in a reading mode, perhaps not a writing one. I’d really love to know, though, which variety, because I’m really curious to know which types of wine grapes are reading this blog. It will make my weekend more interesting. Great post Jo and an interesting question. I have taken the What Wine Are You quiz on Facebook and, to be honest, I don’t think it did a really good job of figuring it out. I would have to say Bordeaux. The reasons are numerous but key among them are the fact that I am a rather diverse person with many layers. The blending of the right varietals, each with their own respective flavor profiles and characteristics, is really emblematic of my personality. Each year the right blend, usually Cabernet Sauvignon, Merlot and Cabernet Franc, are sought after by the winemakers of the region in order to achieve the right layers, complexity, balance and nuance. I have many passions and many interests as diverse as the various blends and wines of Bordeaux and in any given year they are coming together in various quantities to make my own personal blend. Thanks for replying, Micheal. As I wrote, my weekend just became more interesting. So, back to your entertaining answer… Love it. Now I know that there’s someone (you) reading this blog with depth, a rich background, and someone who takes himself seriously… as we all should. And… you’re mutable, in that each vintage you have to adapt to what’s available, delivered by mother nature. Looks like you had fun writing that one. Congratulations!